A MAGICAL PLACE – 100% NO STRESS ZONE. Over the years Driving Creek Villas have been able to build up a very good reputation, simply by doing what we do best – making you feel at home while providing exceptional quality and service. This is reflected in the the feedback we receive both from our guests as well as the press. Ellie Hutchinson and her friend find wilderness and culture rubbing shoulders on a weekend in Coromandel. I don’t ask for much in a short weekend getaway — sort me out with some bracing walks, a bit of art, stunning scenery, a few oysters, leaping dolphins and plenty of R and R and I’m happy. I found all of these in a 48-hour Coromandel break. After an early Friday evening dinner and obligatory end-of-week espresso martinis, my friend Alessandra and I left Auckland on the 6.40pm ferry and headed out into the Hauraki Gulf, looking back on sunset over the city. The ferry delivered us two hours later at Te Kouma Harbour, Coromandel. We spent our first night at Tokatea, one of three self-catered villas at Driving Creek Villas, a hidden gem set in native bush with immaculate private gardens, giving us an immediate feeling of solitude. The beautifully designed villas all have generous sleeping areas, expansive decking and an outdoor Japanese hot tub. After a long week we agreed this peaceful oasis was everything we had hoped for, and it wasn’t long before we were lulled to sleep by the babble of the creek and the resident moreporks. 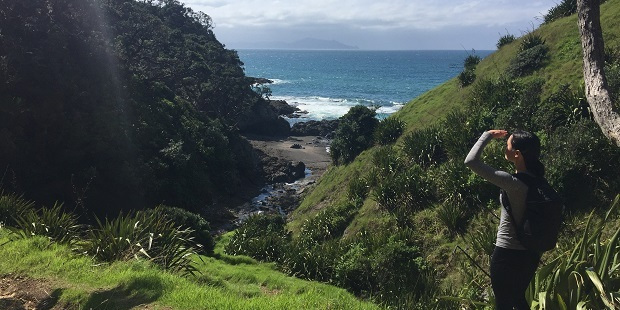 He drove us north to the start of the walk at Stony Bay, along the way providing information and useful facts and stories about the area, and stopping off to take in the views over the Hauraki Gulf and point out the islands. We broke up the two-hour journey with a stop at family run Hereford ‘n’ a Pickle in Colville village, where roast beef sandwiches were freshly prepared for us along with the best Anzac cookies I have ever tasted. At 11am we arrived at the track and began the self-guided 10km walk up Henry’s Hill, following clear signposts along the way. We meandered through the beautiful forest, chatting constantly, admiring the views and stopping at the lookout. On a clear day, as we were enjoying, you can see all the way out to Great Barrier Island. After walking (and talking) for about two hours we stopped for lunch at Poley Bay — a gorgeous rugged beach where we sat on the rocks to eat our sandwiches. We completed the last section of the walk through rolling farmland to Fletchers Bay, stopping for plenty of photos on the way. James then announced that we had had our starter and main course and it was now time for the dessert. As we headed to the Muriwai walk with our wobbly legs, he assured us it would be easy in comparison to what we’d just done, but would hopefully finish us off. The ridgeline track to Wharekaiatua Pa was breathtaking and so were the stairs, but the most breathtaking of all was Muriwai estuary — we had no other option but to cross, so it was shoes off (and for some, pants off) so we could wade through the waist-deepwater. Totally soaked, we giggled as, barefoot, we made our way along the beach and back to the van for a cuppa. The drive back along Port Jackson Rd was lovely. Ancient pohutukawa line the foreshore and as the sun set we saw dolphins, at least 30 of them, playing in the shallow water close to shore. We couldn’t resist nipping back for a soak in the hot tub before heading out to dinner and listening to the tuis and bellbirds as we soothed our aching limbs. We agreed this tranquil retreat is perfect for a girls’ weekend or a romantic getaway, but would also be good for families as clever landscaping means you are invisible to the other two villas. Our restaurant that night, Pepper Tree — a landmark in Coromandel township at over 100 years old — comes complete with courtyard, verandas, kauri wood floors, cosy open fire and mouth-watering menu. We had worked up an appetite and begin salivating over the thought of a dozen freshly shucked Coromandel oysters and award-winning lamb rack, and decided we definitely deserved the lemon meringue and crumble for desert. The following day, we were up early to explore the grounds before departing for a delicious brunch at Wharf Rd cafe, where friendly owners Ellie and Leigh have the vibe — and the coffee — just right. We were lucky enough to get a look at the local art studios. 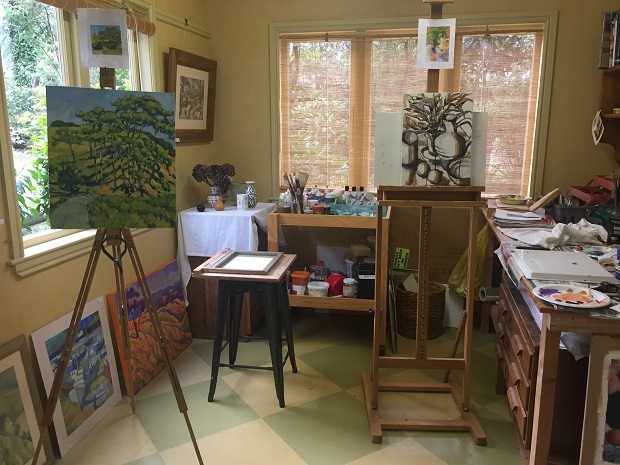 There is an incredible arts community here and the big event, the Coromandel Arts Tour, takes place this year from October 7-15. Builder Kevin Brett clearly has a talent for crafting unique and beautiful furniture from native kauri driftwood, and his work incorporates reclaimed steel. We thought a nice touch was that he includes an inscription on where the recycled materials were found. Other artists we visited included new resident Julie Pijfers with her stunning bespoke shell jewellery, Petra Meyboden, whose prolific Puketai Pottery came complete with totems, Pete Sephton, who makes limited edition screen prints, Diann Cades’ fine art paintings of local people, Stuart Fyfe’s stoneware pottery and Portage Ceramic Award’s finalist Caitlin Moloney’s giant ceramic necklaces with incredibly intricate detail. Her latest piece will be shipped to Hawaii. It was amazing being able to meet and chat to the artists in their own homes and Alessandra couldn’t resist buying her first piece of art from Vaughan Udall’s fantastic home studio. We both agreed we’d found a winning formula for the perfect weekend getaway. Where the air feels distilled by the bush and the soundtrack is courtesy of the tuis. Owner David Foreman has built two cottages on a sliver of family land beside the Driving Creek stream in Coromandel township – light airy structures, beautifully constructed, with a double bedroom downstairs and an attic bedroom upstairs.The front windows over look the stream and the regenerated bush. The cottages are furnished with a pair of very comfortable couches, a lovely old table with bentwood chairs and flax mats on the floor: the essence of Coromandel style. Distance from Auckland: Two and a half hours If you do one thing when you are at Driving Creek Villa: Take a trip on potter Barry Brickell’s eccentric narrow-gage Driving Creek Railway. brickell started the railway – which crosses two spirals and three tunnels, all painstakingly built by hand – in 1974 to carry wood and clay down from the hills to his studio on the flat. Now, it’s a one hour-long trip through regenerating native bush up to the “Eye-full Tower”, with its view over Coromandel and the islands of Te Kouma Harbour, floating in the sea. There are times when parents of young children decide they’d like a bit of time to themselves. Preferably in a luxury, kid-free location with access to good scenery and even better restaurants. So – purely in the interests of research – we drove south one Friday evening, left our three children with an obliging mother-in-law in Hamilton, and headed across the Waikato back roads to Coromandel. We stayed just north of Coromandel township at Driving Creek Villas, near the spot where a prospector named Charles Ring made New Zealand’s first authenticated discovery of gold in 1852, kicking off the country’s first gold rush. Today the main tourist attractions here are the goldfields and the narrow-gauge Driving Creek Railway, which runs through replanted kauri forest. The two villas, which lie a short walk down the road, share a large back lawn alongside the once-famous creek. Both are surrounded by native bush and it’s so quiet you can hear tui singing above the sound of the stream. Owner David Foreman, who designed and built the self-contained accommodation, has gone for luxury in an understated Kiwi-Pacific way – bright orange and dark purple furnishings against white walls and polished wooden floors, a huge kitchen with chrome everywhere and a loft-style bedroom with two single beds upstairs for those who do want to bring the family. Bi-fold doors open on to a deck and a front garden with its own picnic table. For lazy weekend types like us, the big living area is well set up for a night in, with a TV, DVD player and stereo. After sampling David’s excellent cooked and continental breakfasts on Saturday morning, we discovered the railway was closed for repairs. Unable to think of an excuse fast enough, I agreed it was time to hit the craft trail. Coromandel has a reputation as a home for potters and artists of all kinds, so there are many styles on offer. The best advice is to shop around, using the craft trail pamphlet available from the tourism centre. 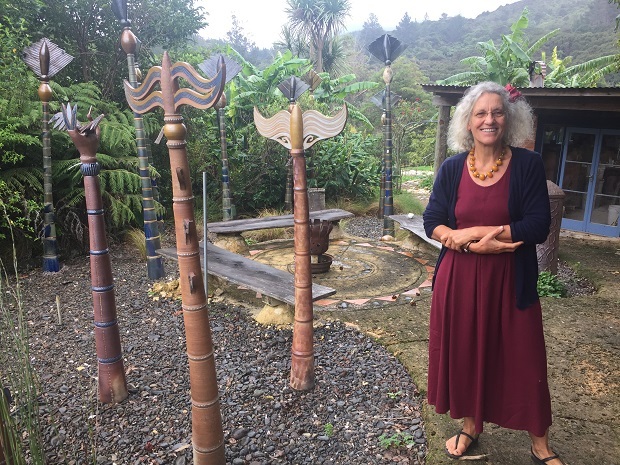 If you want the genuine Coromandel article, it pays to be wary – one shop in the main street was full of Morris and James pottery from Matakana, in Northland. Our favourite place was The Source, where we found a good selection of local artists. Across the street, Weta had an interesting range of local paintings and photography. We picked up Dutch goat cheese, tamarillo chutney from the local Castle Rock winery and some fat, juicy black olives. Down the road at The Coromandel Smoking Company (which also has a store in Manukau), we bought delicious smoked kahawai and garlic mussels, which went down well with a beer and fresh bread from the bakery. You could eat well for several days in Coromandel without going near a dishwasher. At the Peppertree restaurant that night we enjoyed the superb fish of the day – orange roughy with prawns and scallops – in front of a roaring fire. Sunday morning took us to Umu for hearty cafe breakfasts. Even the laziest weekend needs a bit of exercise – especially after this much food – so we tried out some of the walks listed in the tourist centre guide. The first, on Saturday, was a pleasant half-hour stroll, starting from Long Bay reserve and camping ground. The track leads up a hill, through a grove of young kauri trees and down to a secluded bay on the other side, with views across the water to baches clustered around bays on the Colville road. We headed back round the coastline, admiring views of the nearby islands and Waiheke in the distance. On Sunday, we were determined to be more ambitious and headed towards the 309 road to Whitianga, where a 45-minute climb would take us to the top of Castle Rock and magnificent views of the peninsula. Or so they say – as we left town under a brilliant blue sky, a heavy rain cloud rolled in and began to pour down on to the ranges. We took the hint and headed back to town, where we tackled the more modest but enjoyable Kauri Block Pa Track, which starts near the wharf. A steep but well-formed track heads up to the pa site at the top of the hill, where you get an overview of the town and the harbour. We stood in the sunshine and took in the landmarks – SH25 snaking up the steep hill to the east on its way to Whangapoua Harbour, the little nine-hole golf course nestled in the hills to the north, and the baches and bays on the far side of the harbour. It was beautifully quiet. We walked down the other side, then back past the mussel farm and the almost deserted wharf, before heading back to Hamilton and the return of noise. The Source: Selection of work by local artists, 31 Kapanga Rd, ph: (07) 866 7345. Dear David, I cant speak highly enough about the truly splendid paradise we found here and feel as though we have been traveling 6 weeks in NZ just to find Driving Creek Villas and Coromandel. For us, overall, NZ has been far to touristy and we longed to discover the real NZ, I think it is here. No bungy, no buses, no $300 requests for a flight to “X” and at last fantastic food at the Pepper Tree ! We spend our last 2 days here, and what an unforgetful way to say goodbye. I would love to return, thank you for all your hard work. P.S. : there are more birds here than Stewart and Ulva Island put together! Have you stayed at Driving Creek Villas before? We’d love to hear about your experience, please write us.